With over 30,000 Syrians dead, the human cost of the Syrian civil war far outweighs any destruction of property, however great. But the fire that ravaged the ancient Souq al-Madina in Aleppo over the weekend has devastated a UNESCO world heritage site and the best-preserved example of a medieval covered souq. Souq al-Madina mostly dated from the 1400s and 1500s and its labyrinthine covered streets totaled some 13 kilometers. Since Tamerlane had destroyed Aleppo in 1400, they represented some of the oldest structures in the city. 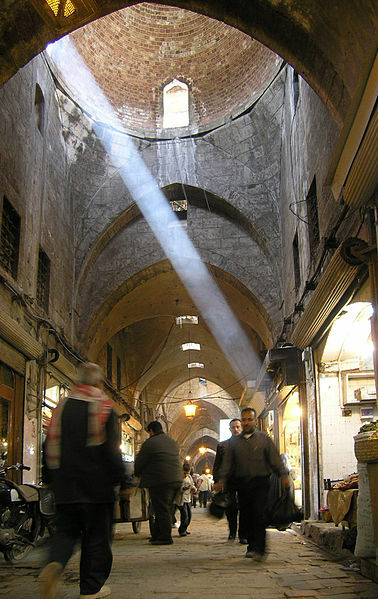 While most of the old cities of the Middle East retain their souqs, Aleppo's, situated along the old silk road that terminated at nearby Antioch, was extraordinary. Cairo's lost their roofing in Napoleon's and Muhammad ‘Ali's day. In the Gulf, shopping malls have replaced the old souqs, or the old souqs have come to look like shopping malls. Damascus' Hamadiyya souq and the old markets of both halves of Fez are extraordinary, but Aleppo's souq was still unique. Other coverage of the tragedy here at Josh Landis' site, here, and here. The fact that the fires broke out during the rebel "final offensive" to take Aleppo means the regime will of course blame the rebels, perhaps justifiably. But whoever lit the fires, the result is the same. Tamerlane himself might be impressed with the results. 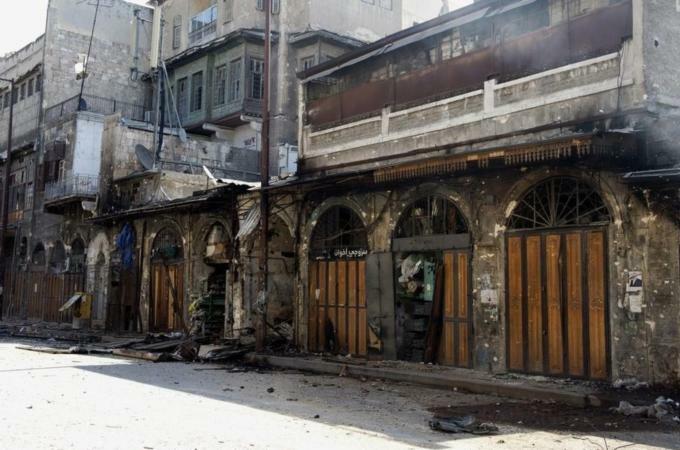 The Old City of Aleppo and its souqs are a UNESCO World Heritage Site, and reportedly UNESCO now estimates that of the six World Heritage Sites in Syria, five have been damaged in the fighting. That is a cultural disaster; the human disaster is more urgent of course, but the world is losing irreplaceable monuments. The Middle East's rich heritage has suffered from the wars and revolutions of our time. Since the Taliban destroyed the Buddhas in Bamiyan in 2001, the region has seen a string of losses: looting of the Baghdad Museum and archaeological sites during the Iraq War; thefts from the Egyptian Museum in Cairo during the revolution, and raids on archaeological sites there as well; some thefts of antiquities in the Libyan Civil War, and reports Leptis Magna was used to store artillery shells; and already in Syria, damage to Palmyra and to the old cities of Damascus, Homs, Hama, and many others. And even the most optimistic are predicting a long struggle in Syria. There are continuing attacks on Islamic monuments, especially tombs of saints, in northern Mali. Again, the human cost is the first concern, but the loss of irreplaceable heritage is a tragedy. Both sides in Aleppo should remember that Tamerlane is not well remembered in the region. Is Bishop Rafael Holding a Jedi Light Sabre? "The Oldest Tune in History"? The Moor on the Mauritanian "Accident"
I'm Rarely Left Speechless, But This . . .
Iran Restores Gmail; Can its "Intranet" Work? Profanities on Turkish Language Institute Site?